Above all, however, we must thank our craning-in crews, our club house caterers, and a particularly big thank to our Banks man ‘Mike Morris’ for all their hard work. A big crane arrives on a windy Tuesday morning and sets up just a few yards off Jamila’s starboard bow. At this point members awaited with abated breath as to whether it would all go ahead. Members chat amongst themselves whilst Wardley’s ‘Banksman’ Mike Morris engages in a serious discussion with the crane driver. High above twenty knots of wind is registering on Jamila’s anemometer. Finally a decision is taken and the crane’s bright red jib elevated itself high into the Blackpool sky, dwarfing the surrounding masts. Next, a large hook silently descended to a point just forward of the driver’s cab, as seen in the photograph, and a set of hardened steel lifting chains were hauled out. GAME ON! Wardley’s crane-in crews organize into gangs of four men, and surround the first boat to lift. Each man must attach one of the four lifting chain hooks to its designated strop. Four crew members clamber aboard Jamila. The two seen in the photograph are to the aft awaiting their respective lifting hook to arrive. John Gorse stood on the port bow of ‘Jamila’ diligently awaits a ‘soon to descend ‘ steel hook. And finally away goes the first boat of the day across the yard, keeping low to the ground because of the wind, and onward into a safe location in mud berth one. She will then be ‘waiting for the tide‘ that is due in a couple of hours. And a little later on, away goes ‘January Six’! The first four boats are placed directly on to the floor of an empty creek and must await the flood tide. Once floating they will be moved to nearby jetties or to mooring out on the river. 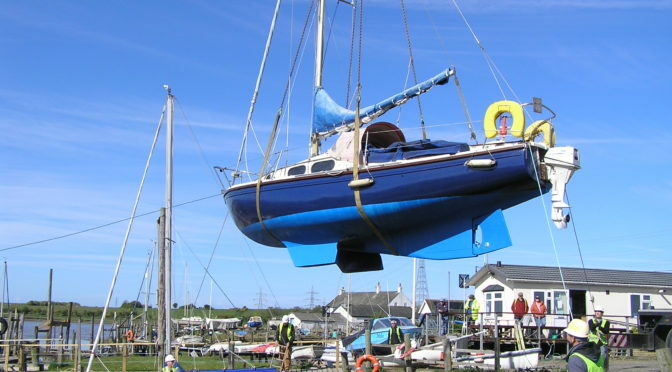 The rest of the boats can then be craned straight into the water. This photo DOES NOT tell the tale, but throughout the day, tea, coffee and bacon & sausage sandwiches were provided by three wonderful ladies (including our vice commodore Lynda Mathews). Thanks for your most welcome contribution!. This particular image was taken very late in the day when John Gorse kindly provided toasted tea cakes to any lingering Wardley’s yachtsmen. This photo only shows a fraction of those served up. Video thanks to Darren Griffiths. Arrriving back for the Jubilee party.